How to Make Banana Muffin Tops (V, GF): this moist vegan muffin top recipe is easy & healthy! 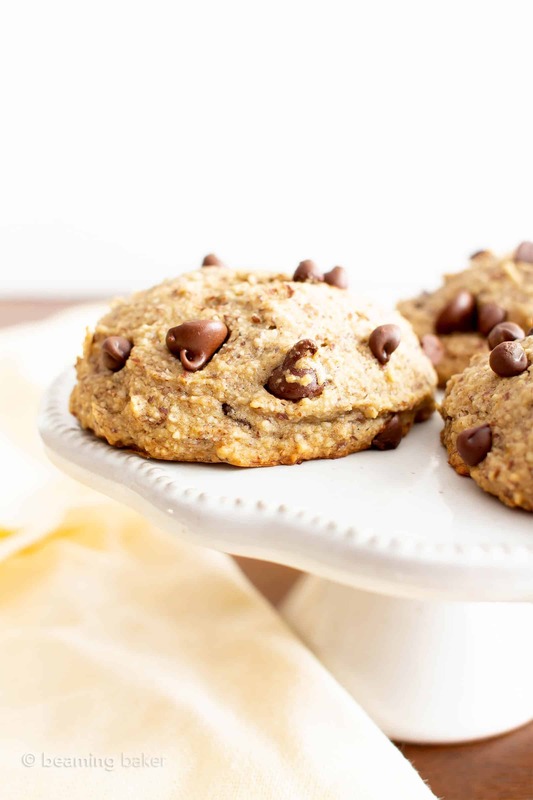 Learn how to make banana muffin tops – gluten-free, dairy-free, refined sugar-free. When we were little kids, my sisters LOVED tearing the muffin tops off of muffins. They were the best part—crispy top, moist interior and they had this beautiful dome full of goodies, like chocolate chips! Naturally, I stood in horror when these poor muffin tops were torn off and their did-nothing-to-anybody bottoms were cast aside. 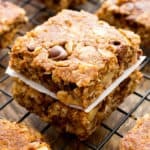 You know me, I’m a softie for the underdog/under-muffin… Just… thank goodness the tops can’t be ripped off of banana chocolate chip oatmeal breakfast bars or this vegan banana nut bread… is all I’m sayin’. 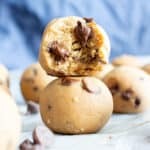 Since muffin tops were already fully a thing by the time I was an adult, I figured I could contribute to the cause (lol) by creating an easy gluten free vegan muffin top recipe! Today, we’re gonna learn how to make/bake muffin tops without a muffin top pan (or a muffin pan). Who’s excited?!? Let’s do it! If you’re looking for a muffin top pan recipe, but then realized you don’t want or need a muffin top pan (hehe), then look no further than this gluten free banana muffin tops recipe! 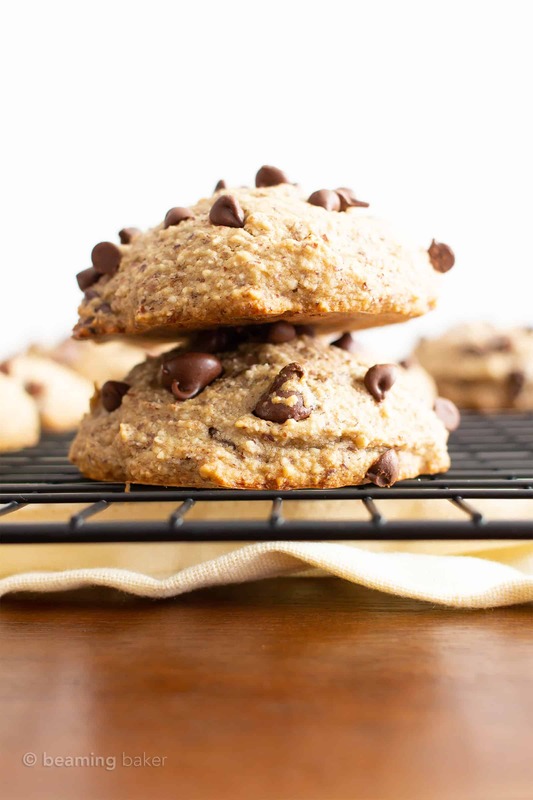 We’re baking these banana muffin tops on a regular ‘ol baking sheet! Store your vegan muffin tops in an airtight container at room temperature, out of direct sunlight, for up to 1 week. Or, you can freeze your GF muffin tops for up to 2 months. 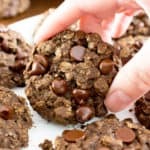 Just store the muffin tops in a freezer-friendly container or bag. Thaw for 30 minutes before enjoying, or heat in 10-second increments until just a bit warm. 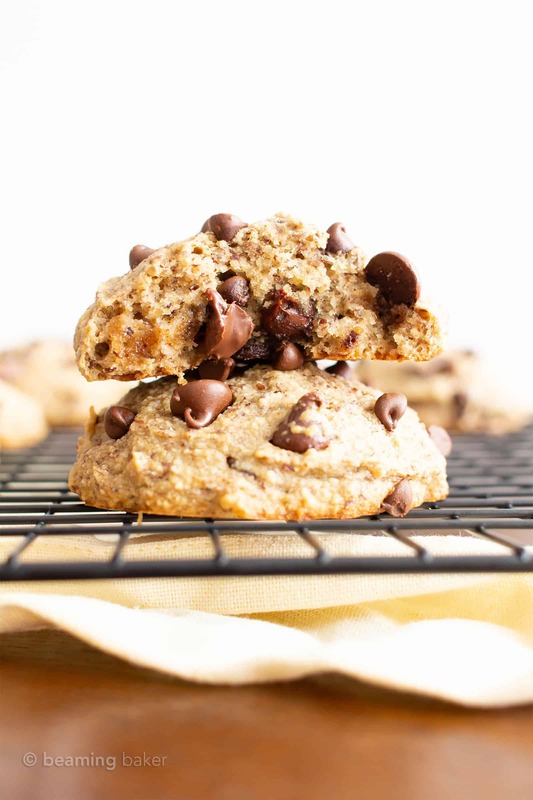 Similar storing instructions for my super yummy vegan peanut butter banana breakfast cookies! Coconut Oil: sub with melted vegan butter, flavorless oil. Applesauce might add too much moisture in this muffin top recipe, so I wouldn’t recommend it. Gluten Free Oat Flour: sub with gluten free all purpose flour or make your own homemade oat flour. How to Make Banana Muffin Tops (V, GF): this moist vegan muffin top recipe is easy & healthy! Learn how to make banana muffin tops – gluten-free & dairy-free! Refined Sugar-Free. Preheat oven to 350°F. Line a cookie sheet with parchment paper or greased foil. Set aside. Peel bananas and add to a large mixing bowl. 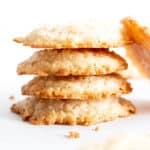 Using a sturdy whisk, fork or pastry cutter, mash bananas until smooth. Add coconut oil, maple syrup, flax egg and vanilla. Whisk until well incorporated. Add oat flour, almond meal, baking powder, baking soda and salt. Whisk together until just incorporated, making sure no flour patches remain. 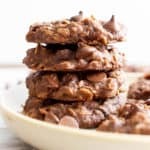 Fold in vegan chocolate chips. Using a cookie scoop, scoop and drop balls of thick batter onto the prepared baking sheet, spaced evenly apart. I used 3 tablespoons of batter for the tops. Tops will expand and spread just a bit. 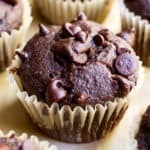 Optionally, dot each muffin top with chocolate chips. Give the pan a few taps to help lightly flatten the tops. For smaller tops, bake for 13-18 minutes. My smaller tops took 15 minutes. For larger tops, bake for 15-20 minutes. My larger tops took 17 minutes. Allow tops to cool on the cookie sheet for about 10 minutes (on a cooling rack). Using a heatproof spatula, transfer tops directly to a cooling rack to cool completely before storing. Storing instructions below. Enjoy! Adapted from my Best Moist Chocolate Chip Banana Bread. 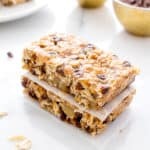 Try my favorite Gluten Free Vegan Banana Recipes: Banana Chocolate Chip Breakfast Bars, Peanut Butter Banana Breakfast Cookies, Banana Bread Coffee Cake. - Storage notes: Store in an airtight container for up to 1 week. - Freezing instructions: store in a freezer-friendly container or bag for 1-2 months. Allow to thaw at room temperature for about 30 minutes, or heat in the microwave in 10-second increments until just warm. - Nutrition Information: is an estimate based on the best-selling, most common brands per ingredient. Also, it's estimated based on 29 servings per recipe, without the optional chocolate chip topping. Tools for Baking GF Muffin Tops like a Boss! 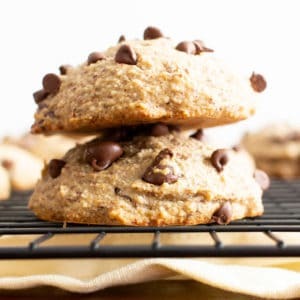 Click the links below to check out my favorite tools & ingredients used to make this healthy banana muffin tops recipe. Cookie Scoop – an absolute baker’s essential. Makes scooping batter super easy & uniform! 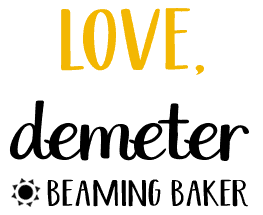 Baking Sheet – my go-to baking sheets. Long-lasting and amazing! Coconut Oil – a vegan baking essential! GF Oat Flour – so convenient to buy when you’re in a pinch. 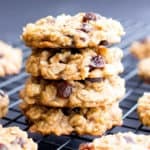 Homemade Oat Flour – my favorite recipe for homemade oat flour! The tops are my favorite part! Love this healthier version. Haha me too! 😊 Now we can eat even more of them! I love this idea and my kids will too! Who wants to eat the bottom of a muffin anyways?? Haha thanks so much for this brilliant recipe! LOL I know, right? 😂 Hope you and the kiddos enjoy them! Well I never! I had no idea such a thing existed! Muffin tops to me means something totally different (size tiny jeans I’m looking at you). Still, it’s a genius idea and a fab recipe! These look so delicious, such an easy, quick & fun recipe to try with kids in the kitchen. Thanks for the share. Love these for an after school snack for the kiddo! Woohoo! I know right? So yummy in the morning! Ok muffin tops used to be my CRACK at Panera. Totally digging this healthier version!!!! Looks divine! 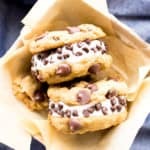 I can make a batch of these at home, definitely a huge hit in our house! Woohoo! They’re so easy and fun to make! 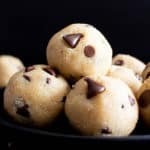 Your Chocolate Chip Cookies look divine! These will be great to have on hand this week! I love how healthy these are! Totally! Hope you enjoy them Catalina! I love that it’s only the tops! Perfect! That’s my favorite part. This looks incredibly delicious! This is a perfect afternoon tea snack. We loved these muffin tops. I generally would put walnuts in banana muffins, but put chocolate chips in and they were great! Loved that they were easy and GF.